For more than 30 years, distribution organizations around the world have benefitted from the industry-specific solutions offered by IBM and Infor. The partnership between these two companies has helped 19,000 companies in 164 countries better manage business processes and adapt to changes within their industries. To better understand the ERP concerns and priorities of North American distributors, IBM and Infor commissioned a study. Conducted by The Frantz Group, the study surveyed a select group of customers who used both Infor A+ ERP and IBM i operating system. The majority of surveyed customers (64%) are using IBM i v. 7X or later, while 36%, are using an older version of the IBM i operating system. Distributors relied on Infor A+ and IBM i to help them successfully navigate the difficult economic downturn. Now, as the recovery gains momentum, they will continue to build on the flexibility and high stability of their solution to improve global competitiveness. However, as technology and the needs of distributors have changed, the Infor A+ and IBM i combination has also advanced, keeping pace with technological improvements. Given the rapid pace of technology, manufacturers who are relying on 10-year — or even 5-year — old ERP technology are missing opportunities to enhance business processes and streamline operations. As 52% of customers noted, now is the time to upgrade to the latest version and take advantage of new advances without sacrificing the stability that has been the hallmark of this solution. 42.3% of Infor A+/IBM i users surveyed are using a software version older than 10 years. This contrast sharply with industry averages, in which ERP users upgrade every 1-2 years. 52% of A+ customers surveyed plan to invest in ERP in the next year. IBM i is widely used for more than just ERP. Critical operations that run on IBM i include backup and recovery and data analytics. 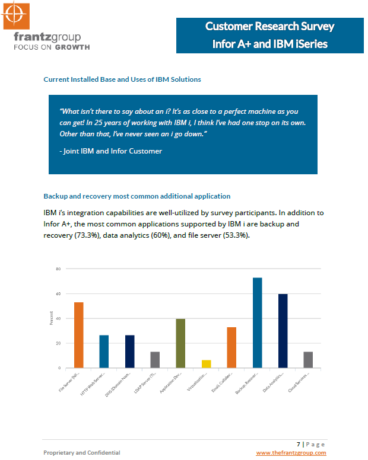 Survey participants are eager to expand those applications that run on IBM i. Security is the biggest investment priority in 2016. For more information about this survey project, please contact us at 800-707-0064.